We'd really appreciate some candy, please. It's teacher appreciation week. Well, Spring teacher appreciation week, because we appreciate our teachers in the fall, too. And on their birthdays, at Christmas and at the end of the year. It's gets a little spendy, actually, but whatever. Monday: Bring your teacher her favorite candy or cookies. Thursday: Have your parents write your teacher a thank you card. I appreciate my kids' teachers a lot. Anyone who would willingly lock themselves in a room all day with Sam and 17 other first graders just like him has my utmost respect because that is not a job I could do. In this way I am grateful for teachers the same way I am grateful for police officers and firemen and the military. They do a difficult job that not everyone is cut out for. I need them on that wall. I balk a little at being told how and when to do my appreciating, but I go along with it because I don't want my kid to be embarrassed because he's the only one who didn't bring chocolate on Monday. So the chocolate and lifesavers I bought this weekend (not at Publix out of sheer spite!) have been sitting on the kitchen counter and the kids have been eyeing them greedily and asking frequently and to no avail if they can have some. Yesterday after school Jack said, "Mrs. S. said that you aren't required to participate in this week's activities." "Yeah!" said Sam, "Mrs. G. said so too. We don't have to do teacher appreciation if we don't want to." This is considerate of the teachers, I think, to keep any kids who didn't buy flowers at Publix from feeling bad. Also, probably there was some backlash after such a big deal was made over "All About Dads" week that quite a few kids cried bitterly when their Dads could not be at school. Our school has a slight tendency to go overboard. "We don't want to participate." There is a short pause and then, "Now can we have those lifesavers on the counter?" I found this note in a box of craft supplies that I was cleaning out the other day. 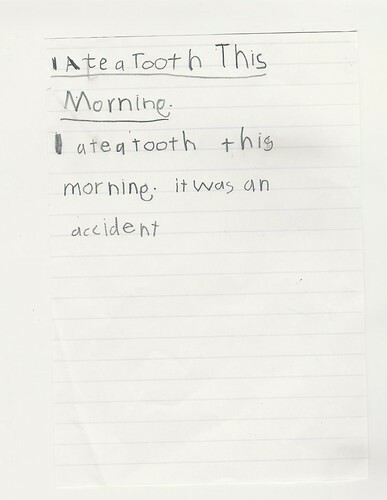 I remember that Jack wrote this in first grade, but I'm not sure why it was in that box. It reads like it's meant to be a poem, complete with Emily Dickenson-type title. I think this may actually have happened. I'm pretty sure Jack swallowed one of his teeth, but I have a vague recollection that it happened at school. Maybe he was just taking a little poetic license. I have no idea. At any rate, I had forgotten how much care he took in his handwriting back when he was learning to write. His handwriting is still neat, but not quite so careful. He loosened up a little when he realized it was taking way too long to write things down. 10. turn off the light." "Hey, what about washing your hands?" "Oh, yeah," he says and heads back into the bathroom with a sigh that says clearly the whole going to the bathroom thing is a lot more work than he had originally thought. Even if you don't zip your pants. This is Puggy, Sam's webkinz. 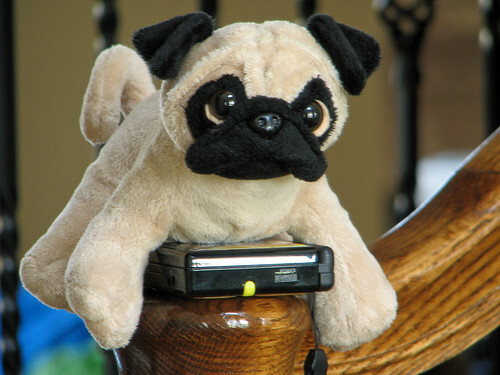 Puggy has a rich internet life where he plays games, keeps a garden of strawberries and watermelons, mines for gems, and most importantly contributes to the webkinz economy as a good consumer earning virtual money at his jobs and then spending it on stuff for his virtual house. The actual Puggy spends most of his days perched here on the banister waiting for Sam to come home from school. On this particular day I guess Sam and Puggy were planning to play some Nintendo, too. Puggy spends every night in Sam's room in a handmade cardboard doghouse decorated with pipe cleaners and crystals filched from a Christmas garland. His life is pretty good. What Puggy doesn't know is that he is only one in a long line of Sam's animal companions and soon he'll be relegated to a plastic bin in the closet along with Big Doggie, Baby Doggie, Baby Dolphin, and Tigey Wigey. He should enjoy the good life while he can. I have a stash of photos of things I see around the house that amuse me. I'm going to share some because maybe some of them are remotely interesting or amusing to someone who's not me. I know that one day there won't be any Legos buried in the carpet, but when you can't go barefoot in your own house, that time seems very far off and difficult to imagine. ** When that day comes I'll have these photos to remind me what life was like way back when. 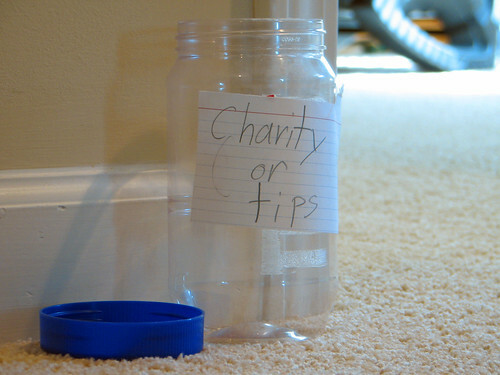 Two days ago Jack set up this jar outside his bedroom. I'm not sure if he's collecting for something specific. I think he's just hopeful that someone might stop by and give him some cash. Hey, a person can always dream, right? I need to teach him that tip jar thing where you put your own dollar in there to get things going. **Wow, this is really way out there, but when I reread this sentence it made me think of Aragorn's speech at the Black Gates in Return of the King with him yelling, "But it is not this day!" An hour of silence when no overturned bucket of plastic pieces comes crashing down to the floor- but it not this day!!! I just read a story on the Internet where a woman found "solstice" in her work. I'm pretty sure that didn't happen, unless maybe she's an astronomer. I have a friend who tends to let a malapropism slip every once in a while (unintentionally, of course) and it always makes the day a little more enjoyable. I heard "Cat's in the Cradle" the other day in a store and was forced to listen to the entire thing. I hate that song. It manages to be both the most depressing song ever written and the song most likely to get stuck in your head and never leave. In fact, just typing these few sentences about it has it stuck in my head all over again. Arrgh. I am hooked on American Idol. I blame this on the television writer's strike. I was never more than mildly interested before. Now I sit with millions of other Americans watching Ryan Seacrest toy with the contestants about whether or not they're going on to the next round. I try to fancy myself slightly better than the masses, though, because I never vote. They get like, I don't know, 50 million votes a week or something, but I've never met anyone who admits they vote. It's like prison, everyone says they're not guilty. When your youngest child walks in the back door and says, "Where's the pick axe, Mom? I need it." it's probably in your best interest to drop whatever you're doing and find out exactly what he needs it for. "Hi! I'm your mom! Change your clothes! We've got to go to karate class! Go to the bathroom! Hurry! Oh my gosh, we're late! Hurry! We're late!" then, taking off the sunglasses, "Are we actually late or are we just running late?" then, putting the sunglasses back on, "We're running late, but hurry up! Get in the car!" I have to admit that this is a fair representation of what goes on in our house on karate class days. If we're lucky and the school bus drops them off on time, we have 15 minutes to turn it around and head to karate class. Sometimes we're not that lucky. Yesterday I read a cheesy quote in the scrapbooking section of the craft store that said, "We don't remember days- we remember moments." I think they meant it to be a good thing. Too bad we don't get to dictate which moments. *"O would some power the gift to give us to see ourselves as others see us." Robert Burns, "To a Louse"
I think I've been putting off posting because everything I want to talk about needs a picture attached and I'm procrastinating going through my eleventy million pictures from last month. That, and the fact that since Jack and Sam discovered Webkinz, I frequently have to kick one of them off my computer before I can use it. And by the time they've finished gardening or gem mining or whatever, I've forgotten what I was going to say. I have to run out and do some errands this afternoon involving the teacher appreciation committee at school and the committee chairperson is a real doozy who apparently doesn't know the meaning of the word 'volunteer.' Ironic considering this is Tennessee. Don't you think 'The Volunteer State' is an odd thing to be? Like, "Hey, if you've got a really nasty job no one else wants to do- we'll do it! And you don't have to pay us! We're volunteers!" I know it refers to men who volunteered to go to war, but 'volunteer' these days doesn't so much bring to mind "heroic acts during times of war" as it does "sorting cans at the food bank." I, for one, think we should go with the lesser known nickname "The Hog and Hominy State." Anyway, my point was that this is going to be short so I can leave the house. Here are a few photos from Easter. We have some company at our house this week. A friend of Greg's and his 13-year-old son who are spending Spring Break cruising around Nashville looking for guitars. If I had ever given it much thought it would have been obvious that there are quite a few uber-cool guitar shops around here, even one worthy of a Visa commercial. When I moved to Nashville the first time, I had a two-day temporary job in the Gibson factory. I was doing your standard boring temp stuff, but one entire wall of the office was glass and looked out onto the factory floor where they were putting the finishing touches on guitars of all colors that hung from the ceiling on a track around the room similar to what you'd see at the dry cleaners. I think I thought that was what living in Nashville would be like- all music, all the time. And for awhile it was. Although not musically-inclined myself, I ran with a musical crowd of young adults trying to make it in the music business. Frequently I'd end up sitting around someone's house while a bunch of folks played guitar and sang old Johnny Cash or Emmylou Harris songs. But life went on and I quit hanging around with those folks. Some of them ended up doing really well. Since I live in the suburbs now and spend my life yawning through karate classes, any contact I have with the music business is all third and fourth hand. Trace Adkins and Aaron Neville live down the road. Local gossip says Faith Hill can be seen at Kroger. We're sometimes late to football practice because the Grayline tour bus is blocking traffic in front of Dolly Parton's house. One friend says she ran into Kimberly Paisley on the elevator at the mall last week. (Hey, David, she said to tell you hi! **) And last month my neighbor said that Wynonna stole her shopping cart at Target. I guess I'm just not paying attention. Aside from seeing Eddy Arnold at a city commission meeting, I've never seen anyone remotely famous. And I only noticed him because they were declaring it "Eddy Arnold" Day. He was kind of hard to miss. Unless someone noteworthy steps in front of my car at the airport, I'll probably never see them. I go to Target all the time, maybe I'll try leaving my cart unattended and see if Wynonna takes the bait.